Since I have been laid up at home, and the kids have been around during their summer break, I have been dabbling in more baking than I probably should, not only to kill time and boredom but to provide a dessert for post dinner meals for the kids. I typically let my daughter handle most, if not all, of the desserts for the family. By default it is typically a small bowl of ice cream, however my daughter will jazz things up with crushed pistachios and a fresh raspberry coulis from time to time. For me, I have little patience and just want to get things done with dessert. This is where the ultimate brownie bites comes into play. Not the prettiest of pictures, but trust me, the picture doesn’t matter as the taste made up for it. Start by baking your brownie mix according to directions. Cook about 3/4 of the way through, then remove from the oven. We are only cooking partially as we are going to load it up and finish the rest with the toppings. Once about 3/4 of the way through cooking, remove the brownie pan from the oven and set onto a non-burn working surface. 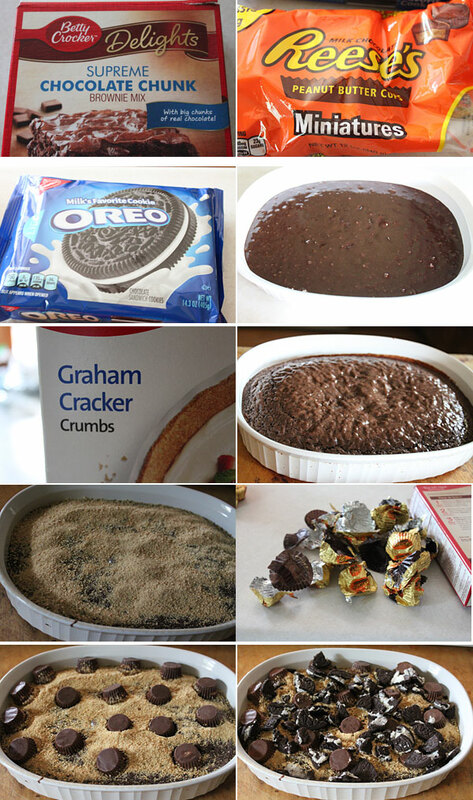 Take the graham cracker crumbs and sprinkle on top of the brownies, lightly coating the top. Next, layer on about 16 of the Reese’s peanut butter cups. 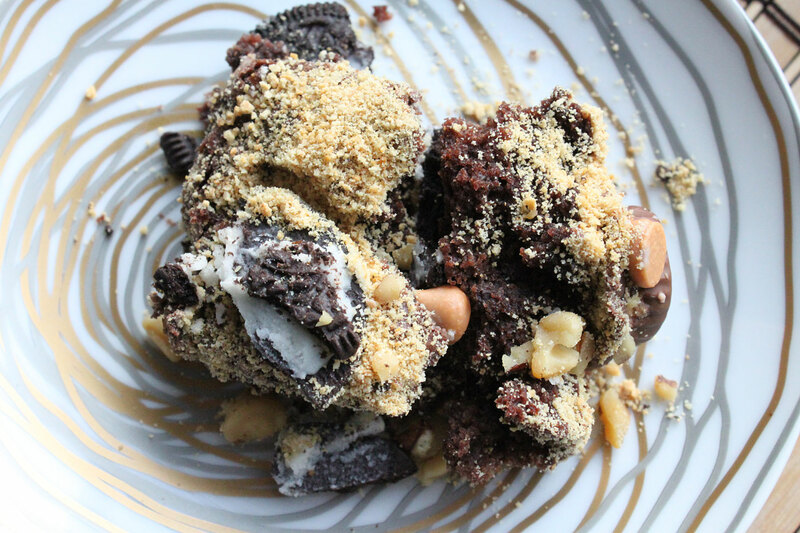 Crumble on the Oreo cookies, then sprinkle with roasted peanuts and butterscotch chips. Place this back into the oven, and cook until the top is nicely melted and the brownies are cooked to your liking. Remove, let cool, and let the kids gaze at this sugary delight until it is time to dig in. Sure, it’s a mess when slicing into it, and it falls apart of the most part, but that’s where the vanilla ice cream come in and acts like a glue to capture all of that loveliness. Was this a hit for dessert? You betcha, and let’s just say it didn’t last long in the house. The good thing is I was able to purge a few things from the cupboard while satisfying the rest of the family. A win, win. Hope you enjoy!